Size: 318 sq.ft. - 2334 sq.ft. Hayat Boulevard is like a city within a city of Town Square. 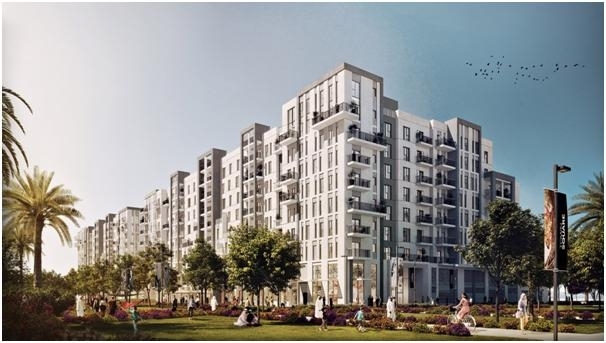 Town Square community is in new Dubai presented by Nshama Developer. The project was established in September 2014 and completion is expected by the mid of 2019. The township is in close proximity to Arabian Ranches Golf Course, Dubai Polo & Equestrian Club and Al Maktoum International Airport, near the site for the World Expo 2020. Hayat Boulevard is a mid-rise towers that are accommodated with Studio apartments, 1 BR, 2 BR, 3 BR & 4 BR above a vibrant podium with recreational facilities. Studio Apt-starting from AED 378,888. Homeowners will find Shops, Restaurants, A Health Clinic, Nursery and Gym within this small city of Hayat BLVD. Nshama realty has been offering world-class well established communities. One of the leading real estate groups in Dubai.Their only aim is to bring a new lifestyle for all type of buyers by offering mega communities for families but will also provide a full-fledged, thriving range of lifestyle developments like restaurants, health centres, malls, retail stores, hotels, cafes, play areas, educational institutes, community parks and more. It is an integrated construction near Al Barsha that features 3K townhouses and 18K apartments in addition to retail, hospitality and commercial phases. Nshama Properties vision is to bring a new lifestyle options to Dubai that transforms the lives of people. Hayat Boulevard is located betweentwo main roads “Al Qudra” and “Emirates Road”. The community will be well-connected via Etihad Rail and bus connections. * 22 minutes drive from Al Maktoum International Airport. * 21 minutes fromDWC Airport. Nshama Hayat BLVD is launched in Town Square (Mega Community) at Dubai Land, United Arab Emirates. Nshama Hayat Boulevard also offers round the clock facilities, Sun Decks, Vida hotel, Retail stores, Restaurants, Healthcare Clinics, Hospitals, Skate parks, Jogging track, Biking trails, Community gardens, Outdoor & Indoor Reel Cinemas, Outdoor gyms, Tennis courts, Swimming pool, Central Air conditioning, Fire Fighting and alarm system, Parking, Basketball courts, Football field and recreational activities along with unconditional amusing facilities of rejoicing.